From the earliest days of the organization, Rotarians were concerned with promoting high ethical standards in their professional lives. One of the world's most widely printed and quoted statements of business ethics is The 4-Way Test, which was created in 1932 by Rotarian Herbert J. Taylor (who later served as RI president) when he was asked to take charge of a company that was facing bankruptcy. This 24-word code of ethics for employees to follow in their business and professional lives became the guide for sales, production, advertising, and all relations with dealers and customers, and the survival of the company is credited to this simple philosophy. Adopted by Rotary in 1943, The 4-Way Test has been translated into more than a hundred languages and published in thousands of ways. To access the 4 Way Test Association web site, click here. One of the things many of us do is forward emails we receive from others. One way to discharge our our ethical responsibility as Rotarians is to apply the 4-Way Test to those emails. Many if not most of such emails, while sounding like the truth, upon investigation turn out to be any thing but the truth and indeed cannot pass the Fairness test, nor the Goodwill, Better Friendships and Beneficial tests. 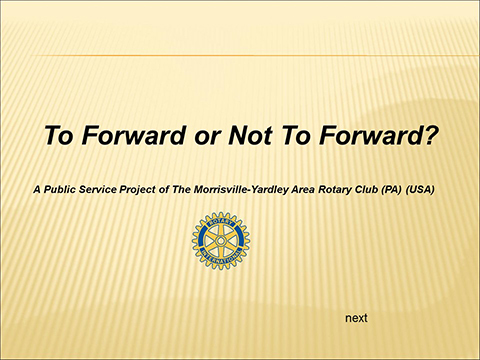 To see a PDF version of the slideshow on this subject click here. To create an email message that you can forward, open the PDF file, save to your computer, copy the following into the body of your own email and attach the saved PDF slide show. Then forward your email to whomever your want. "What emails should we be forwarding?”, is an important question in this ethically challenged world we live in today. Just open the PDF slide show and take a look. Then decide whether or not you should forward this email about Forwarding Emails to all of those to whom you like to forward emails and to those who like to forward them to you. "